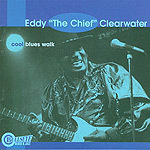 CD review: "Cool Blues Walk"
This review first appeared in the December 26, 1998 edition of the American Reporter. Eddy Clearwater is a veteran Chicago bluesman, a man who's been plying the clubs and gin joints of the Midwest for four decades now. On his latest release, "Cool Blues Walk," we hear an artist who is confident and talented, if not quite polished. Maybe "polished" isn't the right word  the rough-hewn electric blues that Clearwater plays wouldn't really lend itself to polishing, anyway. Rather, what seems to be lacking behind Clearwater's tight boogie beat and sharp guitar solos is a larger vision of what his music is. When one listens to B.B. King, whether live or on the stereo, there's an overall sense of rightness about it. One knows that the song selection, arrangements and choice of musicians are all part of a larger artistic vision that drives the whole process. That's missing in Clearwater's playing. So while there are some nice guitar solos, while the music bounces along, it's uneven. One song is a pure rocker, then the next will be a straight blues, followed by an R&B song. But that's all done without an overriding sense of style to tie them together. B.B. King could do the same song sequence, but when he was done you'd have no doubt you just heard B.B. King music, The same for a Count Basie or Bonnie Raitt. So all the parts are there  Clearwater is a gifted guitarist and passionate singer, and his band can certainly play. All it needs now is something to bring it all together.